In prior articles we’ve touched on the variety of surfaces that Thoroughbred horses run on at race tracks in North America. The following table describes the articles in case you want to review them again, or missed them the first time around. You can click on the Article Title within each row to read it in it’s entirety. From Furlongs To Ovals Dirt Tracks at Saratoga and Belmont. More Racetracks and Stretch Run Variations Dirt Tracks including Aqueduct, Churchill Downs, Santa Anita, and others. Synthetic Tracks An Introduction to Synthetic Surfaces. This article will attempt to pull it all together on the subject of surfaces and also provide some examples on how surface information is presented in the Past Performances (PPs) in The Daily Racing Form. Having just returned from a visit to Keeneland race track in Lexington, Kentucky, I thought it was a good time to discuss the various surfaces that Thoroughbred horses race on. The traditional surfaces in North America are dirt and grass, with the highest value Stakes races held on the dirt. For example, the Triple Crown is run exclusively over dirt surfaces. Keeneland however, has a Synthetic surface made of a mixture of silica sand, recycled fibers (carpet and spandex) and recycled rubber/pvc. I took a close-up picture to the right to show it’s unique texture. 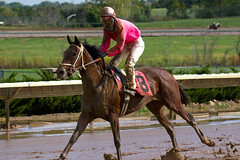 This picture was taken on a warm and sunny day, with very little moisture in the track. Below is a picture of the stretch run taken the same day. In the prior post we looked at the two turf courses at Saratoga. Now we’ll look at a few other interesting turf courses in North America. Below is a diagram of the Widener (Outer) turf course at Belmont Park. In an earlier article (What’s a Furlong?) we defined the standard measure of distance in Horse Racing as a furlong. But, how does that furlong translate into races on an actual race track? The first thing you have to realize is that it varies by race track. While the vast majority of race tracks in North America are oval in shape, they are not all the same size, nor the same configuration. It’s kind of like the difference in Major League Baseball parks. Some have a short fence, while others have a big green wall. The number of feet to left, center, and right fields vary. Some ballparks have grass, while others have artificial turf. Many similar variations occur in horse racing.